NuWall combines the ease of installation in both new or retrofit applications with a pleasing aesthetic appeal. The shadow lines created with the NuWall panel will enhance any structure’s appearance. 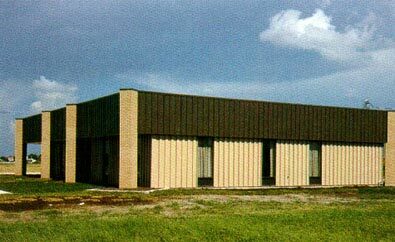 Installation of panels is performed completely outside with no disruption of the workplace on the inside. Fasteners: Concealed fastening system. The panel is attached to the structure with self-drilling fasteners on one side of the panel only. No clips are required. The adjoining panel simply snaps into the previous panel, concealing the fasteners from view. Usage: NuWall is ideal for both new and retrofit applications. In retrofit applications, the NuWall panel can be installed over an existing “R” or “M” panel wall. This saves both labor and material. 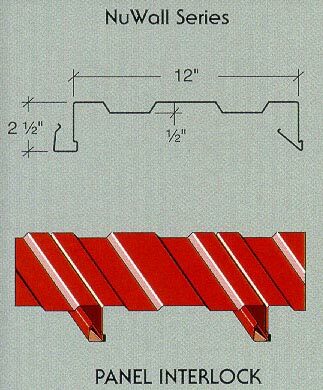 Other panel profiles and other forms of construction may require the use of sub-girts.